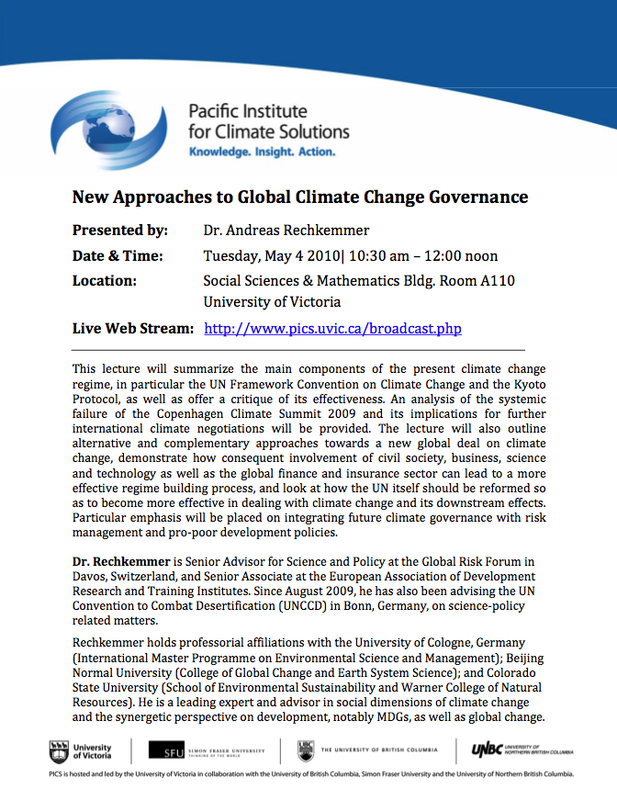 This lecture will summarize the main components of the present climate change regime, in particular the UN Framework Convention on Climate Change and the Kyoto Protocol, as well as offer a critique of its effectiveness. 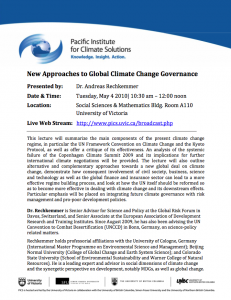 An analysis of the systemic failure of the Copenhagen Climate Summit 2009 and its implications for further international climate negotiations will be provided. The lecture will also outline alternative and complementary approaches towards a new global deal on climate change, demonstrate how consequent involvement of civil society, business, science and technology as well as the global finance and insurance sector can lead to a more effective regime building process, and look at how the UN itself should be reformed so as to become more effective in dealing with climate change and its downstream effects. Particular emphasis will be placed on integrating future climate governance with risk management and pro-poor development policies. Dr. Rechkemmer is Senior Advisor for Science and Policy at the Global Risk Forum in Davos, Switzerland, and Senior Associate at the European Association of Development Research and Training Institutes. Since August 2009, he has also been advising the UN Convention to Combat Desertification (UNCCD) in Bonn, Germany, on science-policy related matters.